It was the summer of 2014 when Jim Wiley and his wife Kristi approached me whether I would be interested in joining them for a few days hiking the wilderness of the Eastern Sierra. I had already hiked with them for 5 days in 2010, bringing in food supplies for the last section of the John Muir Trail (JMT) that they were completing that year. That experience had left me speechless, I had not been prepared for the stark beauty of the Eastern Sierra. After some discussion, we decided that we would hike together for 3-4 days focusing on an area called Humphreys Basin and covering six to eight miles per day. 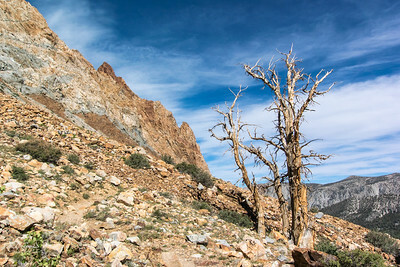 After that I would take of for three days of solo hiking through Evolution Valley, over Muir Pass and Bishop Pass, completing the so-called North Lake to South Lake Loop. This would be great practice for next year when I want to do the JMT by myself. The three of us met up on Wednesday at Mammoth Lakes where we spent the night. Thursday morning, we went to the ranger station to get a wilderness permit for Friday. We were advised that permits for Friday were not guaranteed but that we would be able to get a permit for the same day. So, now we had to scramble. We quickly dropped off Jim and Kristi’s car at Pine Creek where they were planning to exit, bought some last-minute supplies in Bishop, and headed for the North Lake trail head where I dropped off Jim and Kristi. From there it was approximately a 15-mile drive to South Lake where I was planning to exit and wanted to leave my car. Now I needed to get back to North Lake to catch up with Jim and Kristi who were heading up the trail to Piute Lake. I tried to hitch hike, initially not very successful, but after about 15 min was picked up by a lovely Japanese couple. They had just completed a day hike and were on their way to Bishop. After just a few minutes of conversation about Japan and about the awesome gear that Montbell (Japanese outdoor equipment company) makes, they offered to drive me all the way back to North Lake, an offer I gladly accepted. I told them that I would now need to “pay it forward”, a term that I then had to explain to them. With their help I arrived at the trail head at North Lake just as Jim and Kristi were ready to leave. Thank you Hideki-san for your help! We arrived at Piute Lake about an hour before dark and we decided to call it a day. We found a nice camping spot and had a “gourmet dinner”. This was our first day on the trail and therefore we had a tasty but space consuming egg skillet dried meal. Yummy! After dinner we chatted for a bit until it got dark and time to look up. The night sky at 11,000 feet in the Sierra is incredible. Stars galore, the Milky Way visible as a crystal clear band, it gave us new appreciation for how our ancestors must have experienced the night sky and how they must have hypothesized about its origins.